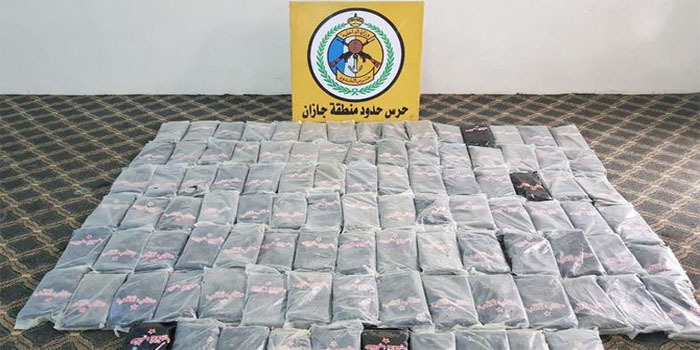 Saudi Arabia’s Border Guards spokesperson announced on Sunday they blocked attempts to smuggle a total of 1,202 kg of cannabis as part of continuous efforts to protect the Kingdom’s land and sea borders. The spokesperson said that all those resulted in foiling and the arrest of those involved. Among those arrested in January were 40 Ethiopian, 10 Yemenis, two Pakistanis, two Somalis, and one Saudi national. The arrests were made after the suspects were caught crossing the Kingdom’s southern border. The spokesperson said the suspects will be investigated according to the law.